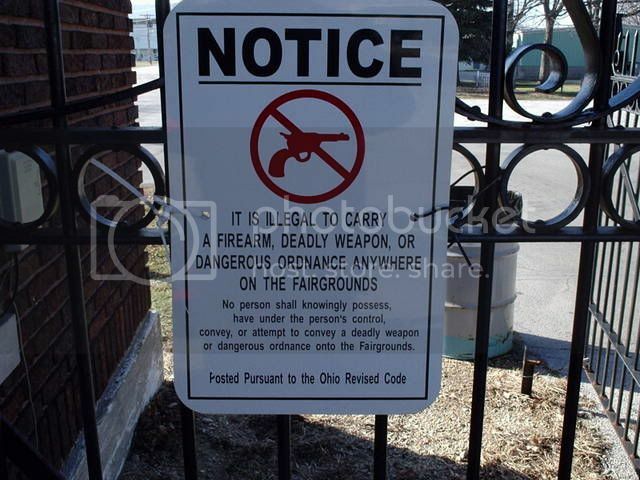 Also, I noticed signs still up at the Darke Co. Fairgrounds today. I updated the DNPWA listing with a picture. (I did not (honestly! )see the signs last month during the fair that were at all entrances. I live in Mercer, above Darke, I took a ride down there and got the pictures. Really strange wording. These are on the East entrances. I had some contact several years ago, they claim they are a private organization! their State Audit says differant. It's been a couple of years since I was at the Darke county fair. I may have to go next year. Armed that is. I'll have to ask my father in law and see if he knows if its a private organization. I was in the area this morning, so I swung by the Fairgounds. All entrances are still posted CPZ. I had a hand in getting my County Fairgrounds CPZ signs removed. But I personally have given up on Darke County, I don't live there and have no reason to visit that fairground. I contacted them several years ago and never got a reply. Thanks for the update. I’ll will be attending that fair this coming Tuesday & Wednesday. "The story you are about to hear is true; the names have been changed to protect the innocent"
I attended this fair on Tuesday, Wednesday, & Thursday. I entered at Gate 6. It is the south gate (general admission parking lots). The gate and parking lot are NOT POSTED. The buildings are posted with the incorrectly worded signs posted in Cruiser’s earlier post. I think I gained 5 lbs. johnisaly wrote: I attended this fair on Tuesday, Wednesday, & Thursday. I entered at Gate 6. It is the south gate (general admission parking lots). The gate and parking lot are NOT POSTED. The buildings are posted with the incorrectly worded signs posted in Cruiser’s earlier post. I am not familiar with Gate 6 but it could be a gate that is only used for the Fair and it got overlooked. Maybe you should tell them they missed it! Could someone check the fairground entrances along RT. 49 in Greenville for CPZ signs? I was there over the weekend and entered through the south entrance, in the parking lot off Eidson. There were no signs at the entrance. On our way out I noticed that there were GB signs on the horse barns near the south end of the grandstand. 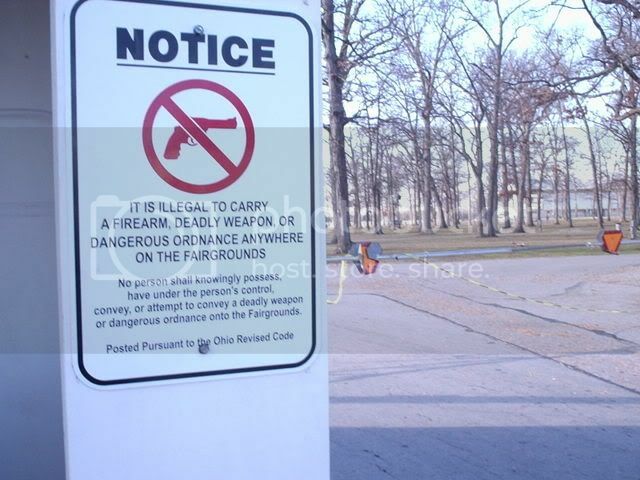 The same ones shown in the pictures above that state "anywhere in the fairgrounds". Not sure if they just never took them down or if that is still their official stance. Regardless, it wasn't posted when I entered and ended up being a non-issue since I was leaving anyway. I am in contact with both the County Prosecutor and attempting contact with the fair board. The fair is going on now, so they may try to stonewall and let it go away until next year. That won't happen. I will work with council to get the lawsuit ball rolling if the signs don't come down. Contacted the Sheriff's office... hoping to get a response in a timely manner, though many of the Sheriff's personnel are out AT the fairgrounds as of right now. Darke County sounds like they are going to need a lawsuit... who can I work with with OFCC? Or am I on my own with this? Their fair people told me that they hope my lawyer is as good as theirs. I was contacted by Daryl Riffle of the Ag Society. He says that they are a completely private entity, and ORC 9.68 does NOT apply to them. He DID say he would look into the Greene Cty Ag case with legal council. Send Jeff Garvas a PM.